I’m sure you don’t need to hear about mobile gaming evolution over the last few years once again. The Sony PSP and the Nintendo DS pocket consoles have millions of fans and some really good titles, but mobile phones, and especially the iOS devices, keep threatening their existence. Every new iDevice eats deeper and deeper into their sales. The introduction of the iPhone 4 and the Apple iPad this year marked a turning point in the iOS evolution. Thanks to the superior hardware of these devices – proper processing power and high resolution – we can now play mobile games we’ve only dreamt of before. The Apple gadgets don’t have the means to be a game changer (pun intended), but they are preferred by millions of users and the AppStore gaming demand grows by the day. This, of course, brought us lots of quality game titles in 2010. Here are the games that deserved my money and might easily get yours. There is no doubt the cute angry birds made unprecedented impact on mobile gaming. It’s perhaps one of the most popular mobile games up to date (regardless of platform). Rovio keeps updating Angry Birds regularly, adding new levels, themes and golden eggs. The best part is none of these big updates requires you to pay for it. 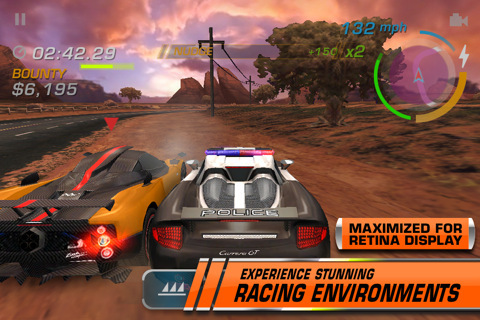 The developer even offers an ad-supported version of the game for free in the Android Market. The Angry birds created a formula that won them more than fifty million iOS, Android, Symbian and Palm fans around the world. After Angry Birds, the arcade games on a mobile phone will never be the same. Unreal Engine 3 on the iPhone? I never thought we would see those awesome graphics on a phone so quickly. But Epic did it and brought its magic to the Apple gadgets. 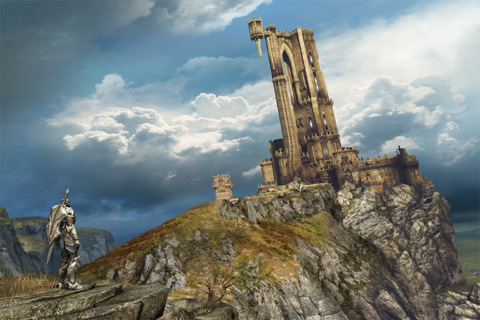 The Infinity Blade is the first game using the new graphics engine. It’s an RPG with decent story, lots of weapons and some unique gameplay. I’m sure the graphics are its key feature, but Epic/Char have managed to give us a really good game. Once you enter the world of Infinity Blade you’ll be staying there for hours. We are promised regular free updates with new places to explore and new weapons. The game is not too expensive either, so I suggest you check it out. After Epic ported its Unreal Engine on the iOS, it was id’s turn to port the Rage graphics. Rage HD is as beautiful as Infinity Blade (sometimes even better) and is set in the same universe as the upcoming PC/X360/PS3 first-person shooter Rage. 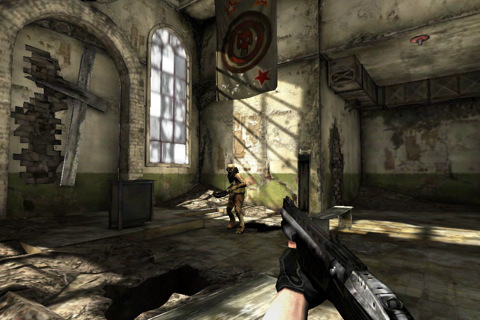 The Rage HD is a rail-based first person shooter, where you move on a rail track and your only job is to look around and shoot. There are lots of blood, zombies, weapons, ammo and health packs. Rage HD has only three (completely different) levels, but it’s a very cheap game and it’s also lots of fun. I’m sure most of the FPS fans will appreciate it. There is no info on updates though. Plants vs. Zombies is another game that made a serious impact. It’s as simple as most of its tower defense siblings, but offers unique approach to the genre and some cute graphics. 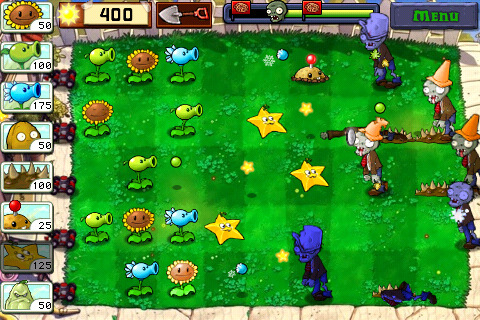 Similar to Angry Birds, the success of the Plants vs. Zombies is because of the right setting and atmosphere plus the simple gameplay. If you love tower-defense games, you should definitely give this one a chance. I’m pretty sure the iOS version of this game was created with the intention of stealing some of the Angry Birds’ pie. In the end, it did manage to grab a bite and succeed where many others have failed. 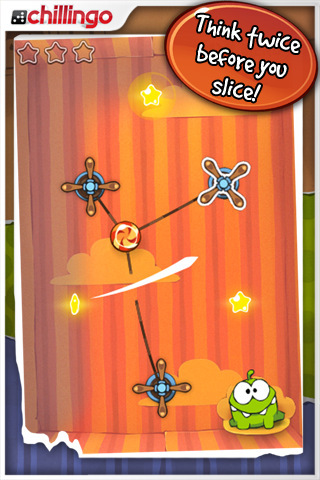 Cut the Rope relies on more physics than Angry Birds, but it’s got an equally simple gameplay. 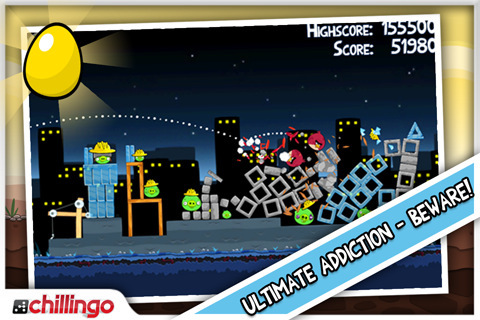 Similar to Angry Birds there are regular free updates adding more levels and elements. If you want to see it in action, there is a free Christmas edition with 25 levels. Everyone who has played the first Dungeon Hunter will definitely get this one. Dungeon Hunter 2 offers better graphics than its predecessor and almost the same gameplay. It’s a typical hack’n’slash RPG, where you explore dungeons, battle with different creatures, collect items, develop your character and open chests. It’s pretty much Diablo for iOS. If you like that type of games, then Dungeon Hunter 2 offers the right mix. 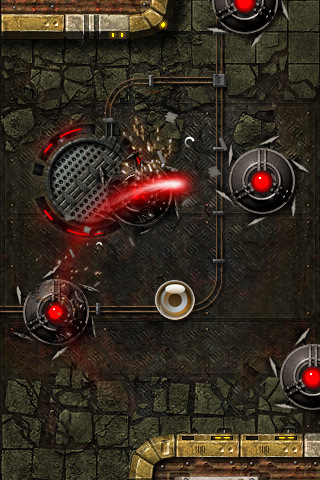 The Dark Nebula episodes are accelerometer-based games with a really simple objective – get the ball through a series of holes, deadfalls and whatnot. We’ve seen plenty of those, but instead of the usual maze, this time around the ball makes its way through complicated high-tech levels overcoming various challenges including moving platforms and deadly robots. And just when you thought you’ve got the heck of it, the game always throws some surprising new gameplay tasks. 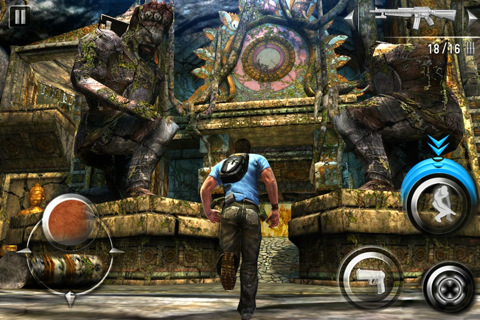 Episode 2 supports Retina graphics, packs 20 levels (compared to 10 levels in Episode 1) and introduces the jungle terrain. All the new levels feature even better design and bring new gameplay elements. Both Dark Nebula versions are as cheap as they get and are many users’ favorites. There aren’t so many original quests these days. In fact most of the current quest titles are just remakes of some old ones. But here comes Hector to save the day. It’s a hilarious and easy to play game that features a mix of real detective work, ridiculous conversations, even more ridiculous but interesting characters, an unbelievable police detective and other crazy stuff. I personally laughed my way throughout the whole game and I highly recommend it. It’s entertaining, cleverly designed and generally hilarious – something you don’t see every day. If you like puzzles and physics, you may also like Cat Physics. 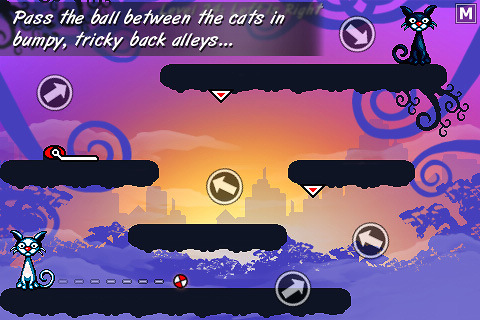 There are two cats, one ball and various obstacles through the level. You have a few arrows that will throw the ball in the direction they point. Your objective is to position those arrows on the level properly and get the ball to the opposite cat. The shorter the path is, the more points you get. The PC/X360/PS3 version of NFS: Hot Pursuit didn’t impress me as much as I expected, but the iOS one has definitely won me. You can play on both sides (police or racer) and it has already been updated with the career mode. It’s very similar to its bigger brother, but doesn’t have the same huge claims for perfection. 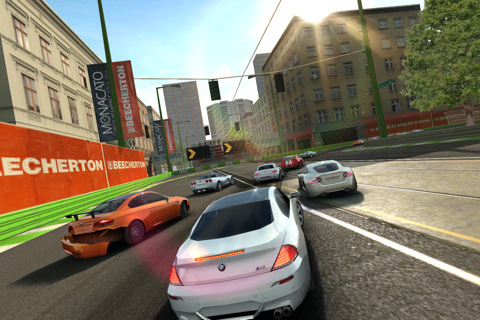 If you search for an alternative racing game, I suggest you try the Real Racing 2. It has some awesome graphics, cars and nice tracks. In fact it somehow reminds me of the Grand Turismo. The bad news for those of you that want to try it is that it is on the expensive side. 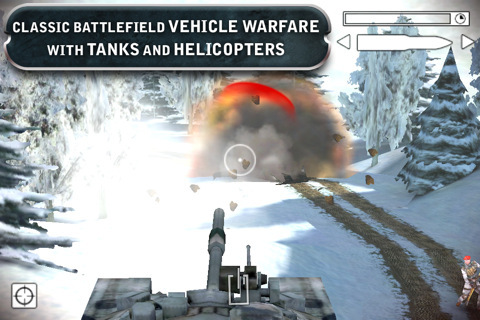 Every Battlefield fan will probably get the mobile version of the Battlefield: Bad Company 2 no matter what I say here. But since I’m mentioning it in this list of my favorite games, getting it might as well be a wise decision. Everyone else who loves good first-person shooters might want to at least check it out. The next game is s like Uncharted on a mobile phone. 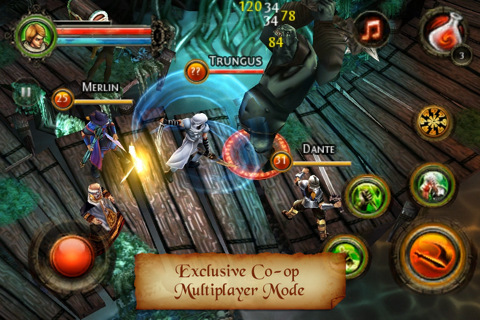 Shadow Guardian has very similar gameplay to the PlayStation 3 top-selling titles. It’s an adventure stacked with actions, easy puzzles, various locations, interesting story, ancient mysteries, etc. Every fan of Uncharted, Tomb Raider and similar games will like this one. I also intended to include the recently released Lara Croft and the Guardian of Light and Aralon: Sword and Shadow, but those games are still full with bugs, they crash often and can get you a headache. Until some critical updates are released, those two aren’t worth your money. The technology is evolving with rapid speed nowadays and I bet 2011 will bring us even more beautiful and entertaining titles. There are new iGadgets coming, the dual-core processors already entered mass-production lines, so I expect the mobile gaming experience to jump on the next level. Oh, and Happy New Year to you all!